Perhaps the most popular hike in Ludington State Park is the Lighthouse Trail where visitors follow Lighthouse and Logging trails to the Big Sable Point Lighthouse and then loop back along the Lighthouse Access Road. Just as scenic, however, is the circuit formed by Lost Lake, Ridge and Island trails. 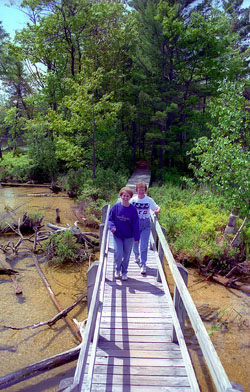 These trails lead you to the edge of the wilderness area and past the fascinating perched dunes above Hamlin Lake. This 4.8-mile loop begins in the Hamlin Day-use Area and makes for a pleasant hike, where lunch can be enjoyed deep in the park at a rustic CCC shelter overlooking the inland lake. In summer, bring a quart of water per person, a hat, and sunscreen, for some stretches of the walk are through open dunes. But the vast majority of the day will be spent in the cool shade of the forest, away from beach blankets, beach balls, and the crowds that congregate along the park's designated beaches. Begin at the Hamlin Lake Day-use Area where there is parking, restrooms, drinking water, picnic area and a pleasant beach overlooking the inland lake, the perfect place to cool off after the hike. At the parking area the trail is marked by post No. 14 and begins as a paved walkway past the picnic area and children’s play area. At Mile 0.3 you pass post No. 12, marking the junction with the south end of the Island Trail. Continue north on Lost Lake Trail to follow a series of scenic boardwalks and docks along Lost Lake and bypass Beechwood Campground. From the north end of the boardwalk Lost Lake Trail continues north along the shoreline, quickly passing post No. 8, marking the east end of the Lighthouse Trail. Steps lead you way from Lost Lake itself to a ridge above the small lake that is followed to post No. 5, reached at Mile 1. This is a major junction, with trails departing in almost every direction. But a display map and a rainbow of boot prints lead you from Lost Lake Trail to Ridge Trail where purple prints continue north. Ridge Trail ascends a ridge and then follows the crest of it, passing a small pond along the way and a set of benches. The hiking here is interesting. For the next half mile, there are steep ravines on either side of the ridge, heavily forested in an old stand of maple and beech. The trees are so thick that the forest floor is almost devoid of any undergrowth. Eventually, you come to a clearing where to the west there is a view of the open and grass-covered dunes of the park and Lake Michigan on the horizon. The trail quickly climbs to its highest point of 712 feet or 128 feet above Lake Michigan, reached at Mile 2. 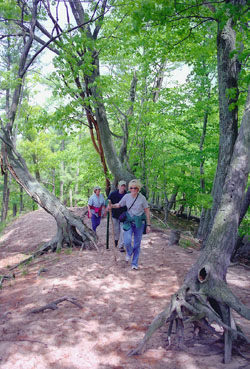 Under the shade of a large oak tree, you are rewarded with an unobstructed view of the dunes and the Great Lake to the west and a portion of Hamlin Lake to the east. More panoramic views follow for the next 0.3 mile as you traverse what is basically a migrating sand dune. On its west side is open sand being inched along by the winds off Lake Michigan. On the east side is a scattering of trees trying valiantly to keep this moving mountain in place. At Mile 2.3, the trail makes a sharp curve and descends off the ridge. To the east, you get a full view of the open and grass-covered dunes that surround Hamlin Lake, a sight equally spectacular to the views of Lake Michigan. 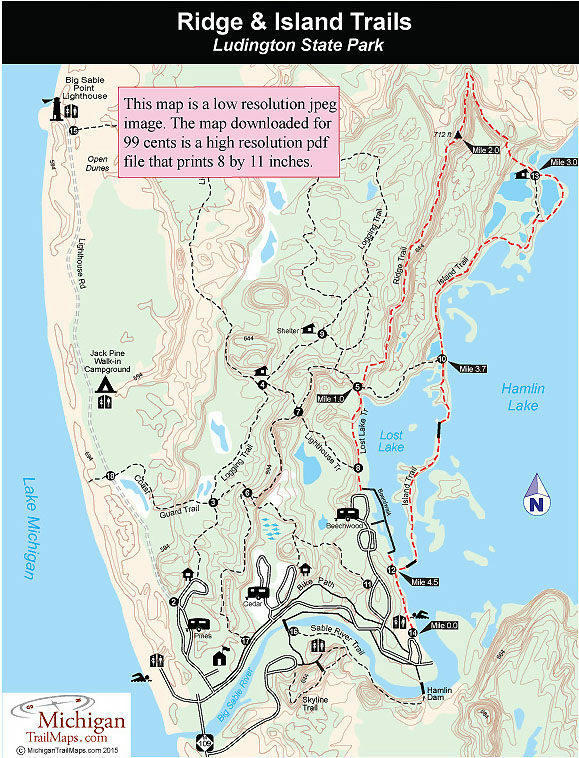 Within another quarter mile, a purple boot directs you to descend into a shaded beech forest, but it's easy here to scramble 50 yards to the top of a sand dune to the east for the best vantage point for seeing Hamlin Lake and the dunes perched above it on its northwest shoreline. The trail, meanwhile, descends rapidly through the forest, swings east (left), and bottoms out at the edge of a pond. Just on the other side is the picturesque stone shelter on the shores of Hamlin Lake. The shelter, like many of the structures in state parks, was built by the CCC in the early 1930s under the direction of the National Park Service. When Ludington State Park officially opened in 1934, Corps members served as trail guides to visitors from sixteen states and Canada. Just beyond the shelter is post No. 13 at Mile 3, marking the start of Island Trail. The trail, marked by blue boot prints, heads south and you have a choice between the main route that winds between two ponds or to follow a somewhat obscured path that veers off to the east and hugs the shoreline of Hamlin Lake. By taking the obscure path you can get an excellent view of the steep dunes that make up Hamlin Lake's west shore. At Mile 3.3, the foot paths merge and Island Trail continues south by skirting the edge of a marshy bay. Tree-studded islets separate this lagoon from the rest of the lake and make for calm water that attracts a variety of waterfowl, often seen resting among the cattails. Eventually you round the lagoons and return to the open lake while passing a small inland pond to the west. Just south of the pond is post No. 10, reached at Mile 3.7 and marking the junction with Lost Lake Trail. Island Trail continues south as it cuts along a scenic spit, with Lost Lake on one side and Hamlin on the other. Just before Mile 4 you cross an impressive bridge and hike across an island, passing well-protected coves on Hamlin Lake that often attract waterfowl and other birds. Within a half mile, the trail arrives at the south end of the island. You can spot the campers on the other side of Lost Lake just before you arrive at a boardwalk and bridge to the mainland. On the other side is post No. 12. Head south (left) at the junction to return to the day-use area and beach on Hamlin Lake, reached at Mile 4.8.